From left: Daniel Loveard, Alice Hadley, Sam Herniman, Jenny Towill, Pippa Jones. 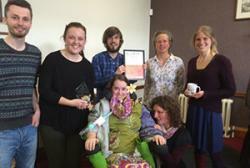 At the front, Dr Sophie Williams and her friend Roz.A lecturer from the School of School of Environment, Natural Resources & Geography received a special award from Bangor University students. The event was opened by Professor John G Hughes, Vice-Chancellor. He recalled how impressed he was on his first encounter with Sophie during a ceremony to mark the start of the Two Dragons Garden project which twins Bangor University’s Treborth Botanic Garden with Xishuangbanna Tropical Botanic Garden in China. This was one of the many anecdotes of the afternoon emphasising Sophie’s strong communication skills - one of the many things which make her an exceptional teacher.